If you are a salmon lover, as I am, you have probably heard of the famed Copper River (sockeye) salmon. If not, you have a little while longer to get some, as the season runs from early May to early June. This is real deal wild Alaskan salmon and, yes, it lives up to the considerable hype. As you can see in the picture (click it for a larger view), the flesh is very red. This is not a mild-tasting salmon. It has a full, rich nutty flavor. Those that are used to the sometimes anemic flavor of the typical farmed salmon might find it a little overpowering. If, however, you like your salmon to taste like salmon should, get some. I chose to give my first Copper River of the year a good cedar plank grilling. I won't go into detail, but suffice it to say that it is about as easy as it sounds. Soak a cedar plank (food grade) in water for a couple hours, lay the filet on the plank (skin-side down), season and grill to perfection (medium-low, about 40 minutes for a 2 lb filet). This year I developed a new citrus seasoning that worked very well. Folks, this is some seriously good eating. 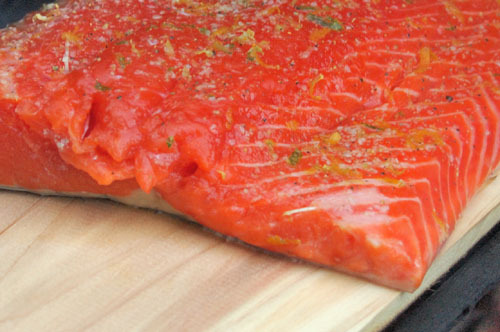 Time is running out, so hit the store and get on the business-end of some Copper River Salmon! Ah! It's so red and fresh and beautiful. I love when the Copper River Salmon Run!